Ken Hughes canâ€™t stand it when British street signs arenâ€™t there to do their job. An English expatriate who teaches graphic design at Kwantlenâ€™s Richmond campus, Hughes has an intimate understanding of how important road signs are to modern transportation. Over the past 10 years, Hughes has been studying signage by photographing lettering inscribed in stone, painted on walls and printed on signs in various places during his travels in Europe. 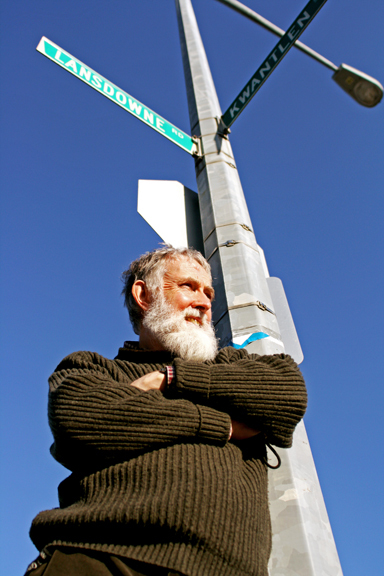 He knows that street signs, or â€œwayfinding graphicsâ€ in the graphic-design world, have meaning beyond just telling you where to go. Street signs, or â€œdirectional signsâ€ to City of Vancouver engineers, arenâ€™t celebrated like parks or bike lanes, but are considered a valuable and constantly evolving community service by those who work with them. Street-name blades, the smaller signs attached to posts on street corners that tell you youâ€™re at Hastings and Victoria, have changed in type size and reflectivity in recent years, enabling safer travel through the city, said Winston Chau, a transportation engineer for Vancouver. The Transportation Association of Canada (TAC) dictates the overall design of signs in Vancouver, ensuring they conform to a standard: white, sans-serif lettering on black background, bordered by high-grade reflective tape. Despite TACâ€™s guidelines, some Vancouver communities have reclaimed their signs and used them to express unique cultural identities. Business-improvement associations in some of Vancouverâ€™s popular neighbourhood districts have applied to the city to have their blades designed to represent their neighbourhoodâ€™s distinct cultural identity, said Chau. Signs with Chinese characters and a distinct 1940s style distinguish Vancouverâ€™s Chinatown, and signs for the Marpole area near South-West Marine Drive are printed in the language and symbols of the Musquem first nation, who historically inhabited the area. The newly refurbished Cambie Village, the Punjabi market at Main Street and 49th Avenue and posh Kerrisdale have also customized their street-sign blades to express character or historical importance. All Vancouver street-signs, including pesky regulatory signs telling you where not to park downtown, are printed in the cityâ€™s sign shop, located at the National Works Yard just behind Pacific Central Station. Responsible for producing everything from venue signs to traffic redirection signs during the Olympics, the shop is shouldering its fair share of work for the games. In the little spare time employees have, the shop also prints individual signs for people as part of their Street Signs for Everyone program. People can order plastic or metal signs, ranging in price from $50 to $90, featuring the names of any Vancouver street. Nick Kazawa, an engineering department employee responsible for managing the shop, said that tourists and locals used to order replica signs of favorite Vancouver destinations such as Robson Street. These days, however, people are more interested in having their own names printed on the signs. Hughes said that these sorts of personal affiliations with street signs, and the cultural pride expressed by Vancouverâ€™s custom neighbourhood signs, are evidence that people want street signs to be more than plain infrastructure. Some designers, such as Englandâ€™s Why Not Associates, are attempting to embed street signs into walls and sidewalks instead of littering the landscape with more poles, shapes and junk to look at, said Hughes. Along with wayfinding information, the group is integrating historical information about the people and cities where the signage is based. â€œItâ€™s not just telling you where things are, but itâ€™s telling you about whatâ€™s there. To me that is developing a sense of civic pride and knowledge of your district,â€ said Hughes. â€œEspecially if youâ€™re younger…sometimes weâ€™re so caught up in working on newer technologies that the history of a place escapes us,â€ said Hughes.